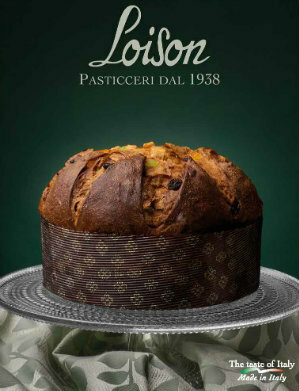 We get very excited every year at this time when our shipment of Loison Panettoni and Pandori arrive. It signals the arrival of the Holiday Season. We have been working with the master baker Loison for five years, but this is the first year we have offered their amazing holiday cakes on our website. Lucky You! In addition to supplying them to our restaurants and specialty stores, we give them to our customers as our holiday gift. In Italy at this time year everyone is carrying a beautiful cake to bring as house gifts. It is not Christmas in Italy without panettoni. Loison's strength comes from husband and wife Dario and Sonia who are committed to using only the finest ingredients and observing the traditional recipes and techniques. Their reputation is known all over Italy for producing the finest holiday cakes. Dario is in the kitchen; he is the master baker. Sonia does all the designs for the packaging. And beautiful they are. From boxes with exquisite paper and silk ribbons to embossed tins, these are stunning gifts. 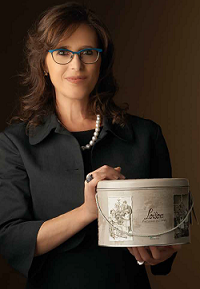 We are offering cakes from Loison's Top Line: Exceptional Quality and Premium Ingredients. 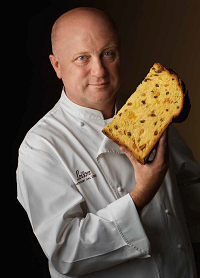 The classic Pastry Panettone features a low shape and is made according to an ancient Milanese recipe. This fragrant cake has a top cross-cut by hand, a soft texture and is enriched with raisins, candied peels of Sicilia oranges and of cedro (citron) from Diamante, Calabria, or it is filled with exotic creams of chocolate or zabaione. Likewise, the Pandoro, made with selected eggs and premium butter, is available both in the classic version or filled with the richest pastry creams. The century-old processes of natural rising and gradual cooling ensure that the product remains fresh and fragrant over time. Artisan pastry making cannot be rushed: time is needed to exalt and skillfully combine delicate flavors full of history. Our supply is very limited and we get only one shipment. Order the finest panettone or pandoro available for your holiday gifts.